WASHINGTON — Cory Booker is running for president. The Democratic senator from New Jersey made the announcement at 7 a.m. Friday in a tweet, email and video. “Together, America, we will rise," Booker said in the video, reprising the theme of his 2016 Democratic National Convention address in Philadelphia that brought the delegates to their feet. “I believe that we can build a country where no one is forgotten, no one is left behind; where parents can put food on the table; where there are good paying jobs with good benefits in every neighborhood; where our criminal justice system keeps us safe, instead of shuffling more children into cages and coffins; where we see the faces of our leaders on television and feel pride, not shame,” he said in the video. Booker now joins a growing field of Democrats eyeing the 2020 nomination for the right to take on President Donald Trump. Booker, 49, has gained national attention with soaring speeches, a large social media following and near-constant opposition to Trump, including a high-profile role in the controversial hearings on the nomination of Supreme Court Justice Brett Kavanaugh. In a buildup to his candidacy, he spent the 2018 midterms traveling around the country on behalf of fellow Democrats, including in the early 2020 primary and caucus states of Iowa, New Hampshire, Nevada and South Carolina. He also began assembling a fundraising list of small-dollar donors, who accounted for more than one-third of the money he raised during the last three months of 2018, Federal Election Commission records show. That helped him build a Senate bank account balance of $4.1 million at the end of the year, funds that can be used to immediately jump-start his presidential campaign. Booker already has rejected donations from corporate political action committees, but they rarely give to candidates in presidential primaries. He plans to eschew donations from registered lobbyists for his presidential run and disavowed an effort by a former college classmate to put together a super PAC to support his candidacy. The former Newark mayor has won plaudits for his speeches calling Democrats to action. He was on Hillary Clinton’s short list of potential vice-presidential nominees. Booker also has captured the national spotlight in a way that many other potential candidates have not, making frequent appearances on late-night talk shows and on Comedy Central, attracting 4 million followers to his Twitter feed, and going on Oprah Winfrey’s show to receive a $100 million grant from Facebook founder Mark Zuckerberg check to improve Newark’s schools. Booker has alternated between being fiercely partisan and willing to work with Republicans. He used his seat on the Senate Judiciary Committee to strenuously oppose the nomination of Kavanaugh and voted against Trump more often than all but four other U.S. senators, all of them running for president in 2020 or considering it. At the same time, he has reached across party lines to work with such unlikely allies as U.S. Sens. Rand Paul, R-Ky., and Mike Lee, R-Utah, on criminal justice issues. His top legislative priority, offering alternatives to incarceration and shorter prison sentences to nonviolent drug offenders, was part of a criminal justice overhaul that Trump signed into law in December. At time of deep partisan divisions, Booker often has talked of unity, offering a different vision than other candidates. 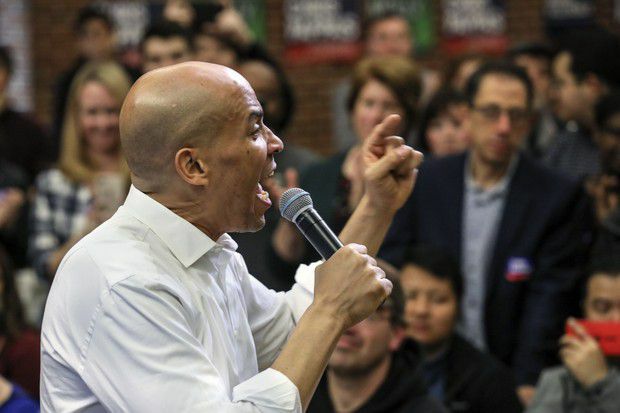 “This is the moral moment we are called to put the ‘united’ into the United States of America,” Booker said in October at the University of New Hampshire. Then-Newark Mayor Booker won his seat in a 2013 special electionfollowing the death of Democratic U.S. Sen. Frank Lautenberg, becoming New Jersey’s first African-American senator. He won a full six-year term in 2014. Thanks to a law signed by Gov. Phil Murphy in November, there is no doubt about Booker’s ability to both run for re-election and for president next year. Booker now joins U.S. Sens. Kirsten Gillibrand of New York, Elizabeth Warren of Massachusetts and Kamala Harris of California; former Rep. John Delaney of Maryland; and former U.S. Housing and Urban Development Secretary Julian Castro among the entrants in the 2020 Democratic presidential contest. Numerous other Democrats also have been talked about as possible candidates for the White House, most notably former Vice President Joe Biden; former Rep. Beto O’Rourke of Texas; former Colorado Gov. John Hickenlooper; Rep. Tulsi Gabbard of Hawaii; and U.S. Sens. Bernie Sanders of Vermont, Sherrod Brown of Ohio, Jeff Merkley of Oregon and Amy Klobuchar of Minnesota.